LEON ZABA VA | PLEA SANTON EXPRE Pleasanton I.S.D. school bus was rammed by a pickup truck shortly after 4 in the afternoon, Tuesday, December 15, at the intersection of Adams and Colwell Streets. There were 47 students on the bus, none appearing to be injured. P.I.S.D. Supt. Matthew Mann was on the scene quickly after the accident. Students were safely assembled away from the bus. 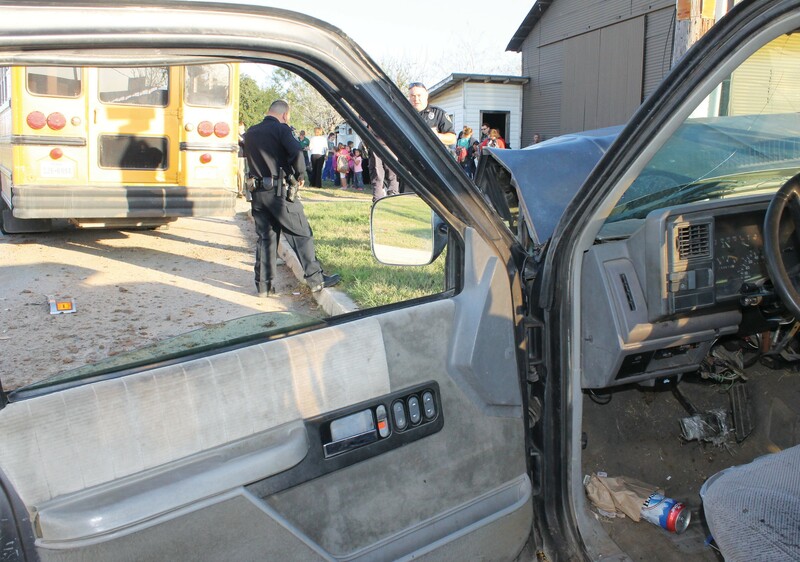 An after school wreck delayed 47 students getting home on Tuesday afternoon. Mario Ramirez, of Pleasanton, was traveling north on Colwell Street and allegedly ran the stop sign on Adams St., striking the middle portion of Pleasanton ISD Bus #15 just past 4 p.m. with a 1993 Ford F150 pickup. No injuries were sustained by the students, but Ramirez was taken to South Texas Regional Medical Center. He was later arrested for Driving While Intoxicated and booked at the Atascosa County Jail. “Everyone is safe and that is most important,” said Dr. Matthew Mann, PISD superintendent. The bus driver, Karen Jurney, was shaken but relieved everyone was okay. Extra buses were brought to the scene to get the students home. Some parents opted to pick up their children.